An inflammation in one or more joints of the body is called arthritis. Due to the inflammation, pain, swelling and immobility in that particular joint can be a common symptom. Arthritis can affect any age group. 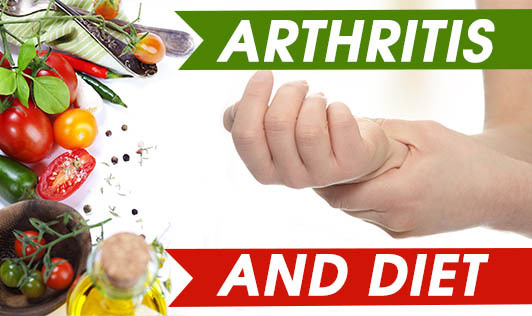 Some researchers say diet plays a major role in controlling arthritis. 1. Have a balanced diet: This includes carbohydrates, proteins, fats, fiber, vitamins and minerals. All of these macro and micro nutrients should be distributed equally throughout the day. 2. There are many foods that may affect the functioning of your medication. It's called diet-drug interaction. There are some foods that have to be avoided. Some of them are cucumber, cabbage, beetroot etc. However, this is completely individualistic and your doctor will be able to tell you more about the diet-drug interaction. 3. Crash dieting and fasting should be completely avoided. Crash dieting may affect arthritis and can have an impact on the activity of important nutrients. 4. Alcoholic beverages should be avoided. They have side effects and can worsen the effects of arthritis. 5. Researchers have shown that foods rich in omega-3-fatty acids can help reduce inflammation. Include walnuts, fish and flaxseeds in your daily diet. If you are overweight and suffer from arthritis, the symptoms may be worse than a person with a normal BMI. Contact your dietitian today to help you lose weight and make sure you are eating right!